Beatles Tribute Band. 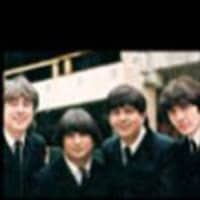 This band has been described as “the best of the Beatles re-creations”. 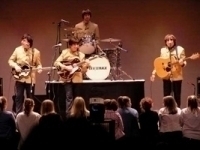 They feature a sensational look-alike, sound-alike cast of former members from the Broadway hit show “Beatlemania”, who can recreate the excitement and showmanship of the originals. The show includes multimedia clips that recall the events of the turbulent ’60’s and highlight America’s first experience of the “Fab Four”, and the hysteria that became “Beatlemania”. (Sometimes, when requested, they add dancing girls to their production. In the course of the show, they not only dance to the Beatles’ hits, but evolve from the teenyboppers of the early ’60’s to the flower children of the psychedelic era.) The tribute show features more than thirty Beatles songs, and every stage of their career is included. It begins with a recreation of their 1964 debut on the “Ed Sullivan Show”, in matching black Edwardian suits and boots, performing early hits like “I Wanna Hold Your Hand” and “She Loves You”. 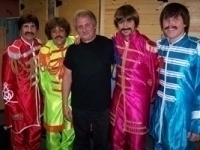 Changing into the proper multicolored satin uniforms, the band then performs songs from the “Sergeant Pepper” era such as “A Day In The Life” and “Penny Lane”. Finally, they cover the hippie days of “Abbey Road” and “Let It Be”. All the vocals are performed live, and each performer plays his proper instrument (well). The instruments, like the costumes, are authentic Beatle originals. They were voted the northern Nevada’s “Cabaret Show of the Year” for two years running.